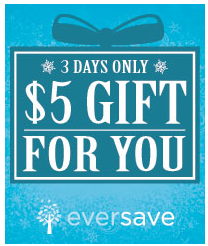 Eversave is giving out $5 credits to everyone! If you are already a member you should have $5 deposited into your account. If not, you can sign up here and get $5! The credit expires on 12/8. If your in Utah, Eversave now has local deals and a local Facebook and Twitter page. If Eversave isn't in your area yet, they always have great "Everywhere" deals going on. Eversave is a daily deal site that has almost every kind of deal you can think of. I've been using them for over a year now and have loved their customer service. Check out their great deals going on today! One reader will win $15 in Eversave Credit! Giveaway will end Thursday, December 8th at midnight MST. Winner will be chosen by Random.org. All opinions are my own. Giveaway sponsored by Eversave. Email addresses will be deleted after giveaway. Your privacy is important. US residents only.